Bacterial meningitis may present with seizures, fever, neck pain, motor paralysis and headache. 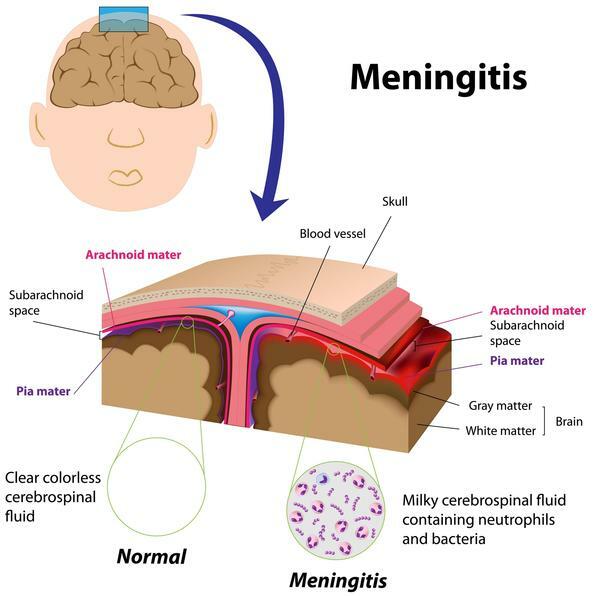 Bacterial meningitis may be divided into acute bacterial meningitis ( 1 to 24 hours), sub acute bacterial meningitis ( 1 to 7 days) and chronic bacterial meningitis ( more than 7 days). Bacterial meningitis may be associated with hearing loss due to hemophilius influenza infection or subdural effusion due to streptococcus pneumonia. The common investigation requires are CSF analysis which may reveal an increase in protein, culture, polymerase chain reaction,blood serology and CSF serology. Radiological examination may reveal swelling, dysmyelination and infarction of the brain. The common complication of bacterial meningitis are cognitive deficit,focal deficit, brain edema,hypoglycemia, hyponatremia, hypovolemia, acidosis, disseminated intravascular coagulation and septic shock. The treatment of bacterial meningitis may include broad spectrum antibiotics and supportive treatment.